Fulvia was the wife of Marc Antony who became one of the most hated figures of the late Republic. She was the daughter of Marcus Fulvius Bambalio and was first married to Scribonius Curio. She was later divorced and remarried to Clodius Pulcher who was murdered in 52 BC. It was at this point in time when Fulvia first made her appearance in the public arena following Clodius’ death. Her husband was the infamous demagogue of the time who was killed in a fracas with his bitter enemy Milo. Fulvia displayed his body to the crowds who congregated outside their house on the Palatine, and gave evidence against Milo in the subsequent trial. Cicero defended Milo unsuccessfully raising the traditional mysterious third party who no one could identify. Cicero argued that Fulvia never let Clodius out of her sight, except apparently on the key occasion of the fracas. Her behaviour could, of course, be evidence of nothing more sinister than close affection or at worst a very dominant wife. But this incident revealed her strong personality to attack on behalf of loyalty, which earned her the continued dislike at that time on the part of Cicero. Marc Antony became Fulvia’s third husband most likely sometime following the death of Clodius yet prior to 45 BC. Cicero hinted that Fulvia had perhaps begun an affair with Antony while still married to Clodius. However, we must keep in mind that Cicero was not above prejudice when it came to Fulvia. Indeed, Antony perhaps did not realize what he had bargained for in this arrangement. As events would later prove, he could find no one who could be more of a fanatical supporter than Fulvia. She also bore him a son, Marc Antony Junior who was later executed by Octavian at Alexandria following the deaths of Antony and Cleopatra. In 44 BC, Cicero tells us that Fulvia was present when Antony executed a number of centurions, when the legions refused to obey his commands at Brundisium. During the brutal and savage incident, we are told that Fulvia was present and that her face was spattered with blood. Antony apparently invited the centurions to his house and Fulvia’s presence there should not be considered as unusual. Nonetheless, Cicero attempts to lay part of the blame on Fulvia clearly showing his bias in the matter. There was certainly no love lost between Fulvia and Cicero. As tradition holds, when Cicero was put to death and his head delivered to Antony, Fulvia allegedly spat on it, pulled out the tongue and stuck hairpins in it, amidst much celebration. Even with the death of Cicero, Fulvia still had her enemies and among them was none other than Octavian himself, despite the fact that Octavian had at one time been married to Claudia, Fulvia’s daughter with Clodius. In 43 BC, the Triumvirs agreed that there were to be widespread proscriptions and seizure of property. While Antony was away, Fulvia acted as his agent in Rome. Another story emerges about Fulvia at this period in time about her abuse of the political process to acquire property. Fulvia is said to have coveted a fine house belonging to Caesetius Rufus. When Rufus at first refused to sell his property, he is said to have offered it as a gift to Fulvia when the proscriptions began. This change of heart apparently did him no good whatsoever since he was proscribed in any case and his head supposedly passed on to Fulvia to be impaled by her on a pole, at least according to Dio. 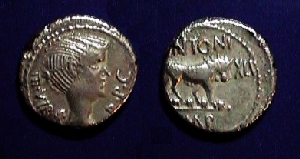 Following the victory at Philippi in 42 BC, Antony departed for the East and Octavian in 41 BC began confiscating land from a number of Italian cities in order to found colonies for military veterans. Octavian’s policies in this matter were met by the stiff resistance of Lucius, brother of Antony and guardian of his interests. Lucius then recruited the aid of Fulvia and she promptly appeared with Antony’s children before his old soldiers and urged them to remember their loyalty to their commander. Lucius also took up the cause of dispossessed Italians. In the autumn of 41 BC, Lucius gathered his troops at Praeneste planning to launch an attack on Rome itself. Fulvia appears to have joined him there, and, according to the tradition, girded a sword, issued the watchword, harangued the troops and held councils of war with senators and knights. This type of behaviour certainly stirred up intense disapproval among the writers of the late Republic. The very presumption of a woman in Roman culture who would seek to command the loyalty of the troops was simply not politically correct. There is little doubt that writers such as Florus described Fulvia as having a lot of gaul or girt to brandish her husband’s sword. Dio tells us that Octavian took great offense at her military posturing. The poet Martial accused Fulvia of engaging in battle out of pure sexual frustration challenging Octavian with ‘aut futue aut pugnemus’ (‘either screw me or let’s fight’). Octavian appears to have chosen the battlefield rather than in the bed when it came to Fulvia; and later Cleopatra for that matter. Octavian moved to confront the military threat and forced the surrender of Lucius’ forces at Perusia. In the aftermath, Fulvia fled with her children to join Antony and his mother in Athens. Antony was less than thankful for her support against Octavian. Antony blamed Fulvia for the failures in Italy and demanded to know what she had done. The one thing Antony did not want at this time was for Fulvia to begin a conflict between himself and Octavian. Fulvia became ill and she at last retired to Sicyon on the Gulf of Corinth, where she died in mid 40 BC, apparently heartbroken over Antony’s lack of support for her and obvious ingratitude for her unending loyalty toward him, not to mention his infidelities. Antony is said to have departed for Italy without ever visiting her sickbed. Within the year Antony would marry Octavian’s sister. While contemporary historians certainly disliked Fulvia, one cannot help to note that she was a woman of strong convictions and unquestionable loyalty. She defended her second husband Clodius even in death and defended the interests of Antony despite his lack of loyalty to her. Fulvia was the first living Roman woman to have her portrait placed on coinage.